The Memorial Day wreck, in which a speeding Infiniti split apart after hitting a tree, leaves grieving friends searching for answers. May 28, 2013, 8:43 p.m. In a city with a grim history of high-profile car wrecks, even veteran police and firefighters seemed stunned by the death toll on Jamboree Road. They called the Memorial Day wreck in Newport Beach the single worst solo-car crash in memory. They groped, and failed, to come up with a worse one. The violent collision, just down the road from Fashion Island and the Newport Beach police station, killed five teenagers from neighboring Irvine, scattering debris and bodies across the pavement. Police say the 17-year-old driver, Abdulrahman M. Alyahyan, a senior at high-achieving University High School, was speeding south in an Infiniti on Jamboree Road near Island Lagoon Drive when the car swerved out of control and struck a tree, the violence shearing it in two. What was left caught fire. Abdulrahman and all his passengers were killed. Among them were two sisters who attended Irvine High School — Robin A. Cabrera, 17, a 12th-grader, and Aurora C. Cabrera, 16, a 10th-grader. 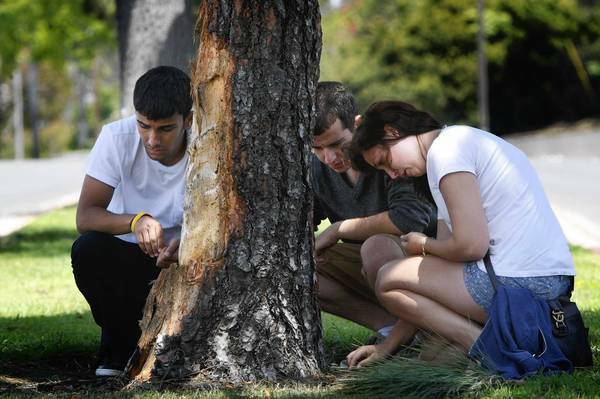 Also killed were Nozad Al Hamawendi, 17, and Cecilia D. Zamora, 17, both 11th-graders at Irvine High School. The car was so fragmented that firefighters initially believed two vehicles had been involved. One of the car’s occupants was thrown partway out of the car, while the four others were hurled out completely, police said. Some of the victims’ injuries were so devastating that the coroner’s office had to rely on fingerprints to make identifications. Newport Beach police said Abdulrahman had been speeding on a downhill stretch of road with a posted 55 mph speed limit. The road is a popular bypass between the 405 Freeway and Pacific Coast Highway. “There are simply no words to convey the sorrow felt by our students and staff, nor are there answers sufficient to explain why five vibrant teenagers who were with us on Friday are gone today,” Irvine Unified School District Supt. Terry Walker said Tuesday. Walker said counselors will be sent to Irvine and University High Schools to help students deal with the situation. Graduation ceremonies are approaching at both campuses. On Tuesday, friends and schoolmates of the victims visited the scene of the crash. “You never saw that guy frown once,” Aram Yaco, 17, said of Nozad. Aram said the crash should serve as a reality check. “I think people should take it as a wake-up call,” Aram said. The girls’ uncle, Bernard Cabrera, said they appeared shy at first and had big hearts. Robin was known as an accomplished dancer with a captivating singing voice. Her younger sister Aurora went by Christine, or Tintin, after the comic book character. On Robin’s Facebook page, friends and classmates left emotional goodbyes. One remembered her from science camp, others from dance and choir. According to Orange County court records, an Abdulrahman M. Alyahyan was cited by the Irvine Police Department last month for improperly modifying a car’s exhaust system and violating his provisional driver’s license provisions. Police would not confirm whether it was the same person who was driving the Infiniti that crashed. Newport Beach, one of Southern California’s wealthiest cities, has a history of headline-seizing car wrecks linked to speeding. In 2009, less than a mile from the site of Monday’s crash, the co-founder of the mixed martial arts apparel company TapouT was killed when his red Ferarri was struck by a Porsche, veered into a light pole and split in two. Police later estimated that the Porsche was traveling at 100 mph. In 2011, three people were killed in a speed-related crash on West Coast Highway, including a former track star from Corona del Mar High School. And in 1997, a speeding Chevrolet Blazer crammed with 10 Newport Harbor High School students struck a median and overturned, killing the son of an Orange County prosecutor, leaving one girl in a coma and injuring others. Sadly “road rage” is still a problem on our roadways. Today, the driver of a BMW was seen driving reckless and after tangling with two people on a motorcycle, purposely cuts them off knocking them off their motorcycle. It just so happens an off duty police officer witnesses the crime – and the driver of the BMW is later arrested. *Read the attached news release below from the California Highway Patrol. On May 18, 2013 at approximately 6:30pm, Phillip Eggers (7/27/88) of El Cajon was arrested after his involvement in a road rage incident on the Coronado Bay Bridge. An off-duty San Diego Police Officer along with other witnesses, observed Subject Eggers driving a blue BMW M3 in a reckless manner while on the Coronado Bridge. After a brief encounter (while in motion) with a motorcycle rider and passenger, Subject Eggers was reported to be driving in the #3 lane, while the motorcycle was in the #2 lane, to the left side of the BMW. According to witnesses, Subject Eggers purposely swerved towards the motorcycle, striking the motorcycle and causing both occupants to be ejected off the motorcycle at approximately 5:40 p.m.
Subject Eggers continued driving off the Coronado Bridge while the off-duty San Diego Police Officer followed the BMW to Glorietta Boulevard where the BMW came to stop. The off-duty San Diego Police Officer identified himself and held Subject Eggers at gun point until Coronado Police Department arrived on scene. After an initial investigation, CHP San Diego arrested Subject Eggers and booked him at San Diego County Jail on the following charges; 664/187 PC, 245(a)(1) PC, and 273(a) PC. If you have questions or need further information, please contact the San Diego CHP office.